Pancake lost his long struggle with tooth problems and severe abscesses today, Friday, June 19th. For the last couple of days, Pancake wasn't eating as much as usual. Today, in the afternoon, he was cold and curled up in his favorite hiding place - he wasn't tempted by any of his favorite foods, and didn't want to be held, which is unusual for Pancake. Pancake's abscesses had grown and multiplied in recent weeks, even with rigorous treatment, meds, and several surgeries. He was taken right to the vet, who has been closely monitoring him. Sadly, it was Pancake's time to leave us today, and he left behind a lot of people who cared for him deeply and were rooting for him to overcome all of his dental problems and abscesses. Pancake will always be remembered as a very sweet and loving bunny. We will all miss Pancake very much. backyard and didn't have the means to care for him. Weighing it at 2lbs 2 oz, his teeth were overgrown and his fur was caked and matted, making him look like a brown dwarf adult bunny. He turned out to be a very young bunny. The Oakland Animal Services staff and volunteers went to work trimming his teeth and his fur and attempted to feed him. Most bunnies don't like to be force fed via a syringe and Pancake was no exception. Recognizing that he was going to need a lot of TLC, they called SaveABunny. With care and attention, Pancake has grown over the past 5 months into a beautiful cream colored bunny with brown ears, nose and feet and weighs a whopping 4 lbs 3 oz now! 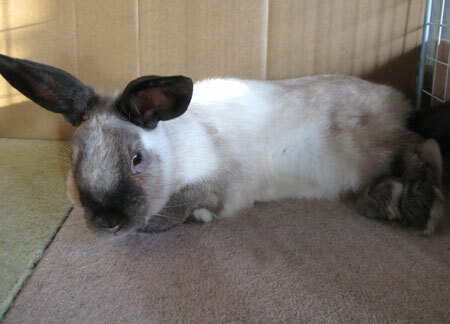 He is approximately 6 months old, curious and friendly and likes meeting new friends, be they bunny or cat. Pancake is also incredibly laid back and loves to cuddle. possibly some molars. Bunny dental care is very expensive and donations of any size are needed and would be would be greatly appreciated!